the php error log fills with error and warning messages. and the phpdig package on ambrosia60.dd-dns.de, the local search engine. Updated software packeges you'll find under Ambrosia60 Software Development. [23.09.2010] After 2 months w/o a running Virtual Host I've rebuild a new Virtual Host. A restore of the SQL Server VM from June this year, needed maintenance again, but wasn't that easy as back end of June. Problems with the VM Host on 3 defective Hardwares tooks a long time to identify. Once solved, the remaining disk capacity runs out of disk space. Maintenance tasks couldn't be completed. Recovery of several other VMs is ongoing. [19.07.2010] Virtual Server #1 crashed with Systemharddisk failure. This corrupted the last 2 backups of the virtual mysql machine so this backup is not available. Trying to repair the data disks of Virtual Server #1 on Virtual Server #2 corrupts Virtual Server #2 also, so that the virtual machines currently not available until the Virtual Server #2 be back online and the virtual machines to be recovered. [22.04.2010] The FidoBase documentation hasn't continued. Kees is working on procedures for importing *.pkt's to MySQL thru the queuing system but not yet seen any script. Since dirks import stopped about Oct / Dec 2009 my *.msg archive never imported to my local Fidobase2 MySQL base. So I've started my own development of the *.MSG to MySQL import PHP script. (UNIX line terminations instead of DOS line terminations). This prevents Diffing and repair compile of missing R23PNT lists. repack and re-archiving into the FHP archive. lists much more sources for R45, R46 and R50 pointlists. so i'd recovered the missing diffs as well. Nodelist archive @ nodehist.fidonet.org.ua too. hosted by Kees van Eeten. [11.12.2008] The Mirroring project starts into the 2nd deployment phase. On fido.ddutch.nl the archive has been mirrored for a while by Kees van Eeten but the portal hasn't finished yet. The NODELIST.PHP archive script needs some modification to run under the mirror. Also the transfer of the nodelist database needs some further inspection. [29.9.2008] NDL2DB re-import #4 finished. [23.9.2008] started the 3rd or 4th complete nodelists re-import after be aware of missing state and keyword entrys from the prior import. data is now stored into a 2nd database until finished. if finished i'll switch also the websearch form to connect to the 2nd database. Also updated NLARCHIVE2 v2.00-rc9 websearch script to display state and keywords correctly. [6.6.2008] ... and re-import finished. The NLARCHIVE2 query results are now based upon the complete and fixed Fido-History-Projects-Archive of nodelists. [4.6.2008] Inspired by Michael Dukelsky (2:5020/1042) i've modified the simple queries of the NLARCHIVE2 search form and added the 1st entry dates of the listed records into the output list ordered chronological. [30.5.2008] it seems that some minor problems in the beginning of the NDL2DB import process results now in more and more data mismatches within the database, so the results are not so accurate as expected. [30.4.2008] NDL2DB import of Nodelists finished successful. The results of the NLARCHIVE2 Search Form now are complete as nodelists exists. The range of actual imported Nodelists is listed in the header section of the search form. [28.4.2008] Actual there are 585 of 924 (63%) nodelists imported. [30.3.2008] After recovery of the Fido-History-Project scripts (see Daten-GAU 29.2.08) i've started about beginning of March with the Nodelist import into the database. This weekend i've now started with the deployment of the web search form. My first introduce is the NLARCHIVE2 script. [17.4.2007] One of the results of the Datteln Euro Con was a question about sources of old Nodelists by Steven Leeman - the beginning of the Fido-History-Project 3rd Generation. In the meantime i've added R22 (Finland [Poss]) and R48 (Poland [Boss]) pointlists. Newer actual Nodelists, Pointlists and Fidonews will be automaticly added. A 2nd actual mirror is held by Kees van Eeten (2:280/5003) well synchronized with Rsync. But there is still no online access. The online access has been gone by a disk crash. Will be recovered soon. This archive has been collected primary by Gisbert with others from many sources. 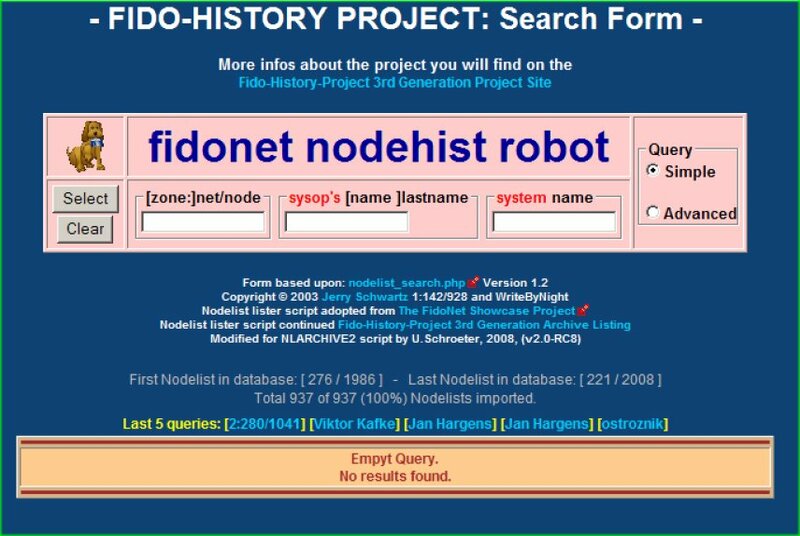 One of the sources was the former Fido-History-Project from ftp://ftp.fidonet.org/fidonet/fido-history (Offline). After review of the Nodelist and Pointlist archive, i've descided to add missing files, 'cause Gisberts archive ends in 2004. The Pointlist directory only includes Region24 fakenet Pointlists. Other regions and the Z2PNT list archive completely missing. Region24 Bossformat pointlist that starts distribution as the main R24 pointlist in 2001 with daynumber #173 on June, 26th isn't realy reflected by the archive, so i've start restructuring the Pointlist directory and adding addtl. Pointlists. The live Fidonet NodeLists / Pointlists / Fidonews Archive (Script) @ AMBROSIA60 now includes Nodelists (and Diffs), Pointlists (and Diffs) (from Z2, R23, R24, R28, R31) and the Fidonews listing. A content search and statistics are still under construction. Added R34 (Spain) Pointlists from 2001, 2006, 2007 Boss and Fakenet Formats. for better mirroring to other websites. Removing tables, replaced with css div's. Font size, font color and page positioning improvements. nodelist.php and nlarchive2.php script display style improvements. java script fix to load java scripts from a separate file. A planned R46PNT removal from Z2PNT distribution was simultaneous with the Region 23 nodelist segment removal, caused by a RC23 fault replacing Region and Hostlines with Unpublished. Therefor also the R23PNT gets removed from Z2PNT distribution for one week. Reapplied on Nodelist and Z2PNT #225/10. Currently there is no Virtual Server running so that no virtual machine can run with the Database search and therefor this service is currently out of order. In relation to the Virtual Server #1 the virtual machine with the Database search is currently not available. Recovery of missing R23PNT lists and repairing line terminations problem, diffing and re-archiving of files from 2008 and 2009. Within the mirroring project problems with lower and upper filenames occures so the script doesn't find files that are in the archive. Now the script is enhanced to search files by lower and uppercase so it becomes more case-in-sensitive. Directory names treated lowercase. Now its simple to get an overview over the last 5 weeks and the arrival of all the lists by selecting the 'Last 5' options view. The view displays all the lists and diffs and their existance in the archive. Exceptions will also be displayed. ... to simplyfy the search within the nodelist.php archive script. The recovery of R50PNT lists between 1997 and 2007 with R50PNT_D's has finished. 1997: #318 - #360. Ok.
1998: Lists recovered in full. 1999: Lists recovered in full. 2000: #007 - #098 Ok. #105 List and Diff missing. 2001: Diffs complete but no list can be created as of missing #105/2000 List. 2002: Diffs complete but no list can be created as of missing #105/2000 List. 2003: Lists recovered in full. 2004: Lists recovered in full. 2005: Lists recovered in full. 2006: Lists recovered in full. 2009: Lists and Diffs recovered in full. Starting R50PNT.072/1998 upto R50PNT.365/1999 there is a change in the admin line format that lets EDTNL v1.16 results in a CRC mismatch. Recovery of 1998 and 1999 R50PNT lists continues. 1st step: merged with the archive. Tried recovery of Lists from Diffs with some starting Lists. 1998: #002 - #065. Ok. #072 ends in CRC mismatch. 1999: #001 Ok. #008 ends in CRC mismatch. 2003-2006: Lists recovered in full. from source ftp://vlcorsar.dyndns.org (Anton Kuznetsov, 2:463/648). With the complete list of R46 Pointlists PNT46REG from 2007 upto 2009 i'd recovered the missing R46PDIFFs as well. from Z2PNT.040/01 and diffs. Z2PNT.040 / 2001 is actual the oldest Z2PNT list. 11.01.2009 Downloaded R50 Pointlist R50PNT.304 (2003)! from source http://www.fido.kr.ua/data/pass/ (Offline) adds many more older lists and diffs from the R46 pointlists distribution so a recovery of lists from year 2003 and 2004 can start. A 2nd source ftp://ftp.3logic.net/pub/fidonet/info/pointlst/ has lists old files from year 1997 and 1998. 11.12.2008 The Mirroring project starts into the 2nd deployment phase. On fido.ddutch.nl the archive has been mirrored for a while by Kees van Eeten but the portal hasn't finished yet. The deployment of the mirror portal has started. Starting modifying scripts and html pages for compatibility. The mirror of the Fido-History-Project by Kees stops syncing about 3 months ago as of an ip-adress change. Now the Rsync has been moved to a static line and the mirror has been re-sync'ed. Starting Z2PNT.284 the Region 50 Pointlist segment is re-included in the Z2PNT distribution. The Z2PNT_D.284 were distributed in full as too many differences between the #277 and #284 list. The 4th full NDL2DB re-import finished. The 3rd or 4th NDL2DB re-import has started with v2.02-beta1 version after some more data inconsistency has been found (state and keywords not allways displays correct or missing). I've also modified the advanced queries of the NLARCHIVE2 ( see v2.0-rc9 infos ) search form and added the state and/or keywords to the output list. Added a back link to the Nodelist Archive Listing and NLARCHIVE2 Search Form to the main project site and the actual design is shown in the link icons. Moved 2nd link into the first visible area. 6.6.2008 NDL2DB re-import of Nodelists finished. NDL2DB import of Nodelists finished successful. The results of the NLARCHIVE2 Search Form now are complete. Known Nodelist failures are fixed. The NDL2DB re-import now has passed the 50% level. Inspired by Michael Dukelsky (2:5020/1042) i've modified the simple queries of the NLARCHIVE2 search form and added the 1st entry dates of the listed records into the output list ordered chronological. The last NDL2DB import of Nodelists finishes with an unknown count of datamismatches. So i've decided to reset the whole database import and restarting the import process. In the meantime, the results of the NLARCHIVE2 Search Form now again incomplete. The range of actual imported Nodelists is listed in the header section of the search form. 30.4.2008 NDL2DB import of Nodelists finished. NDL2DB import of Nodelists finished successful. The results of the NLARCHIVE2 Search Form now are complete as nodelists exists. The range of actual imported Nodelists is listed in the header section of the search form. Total 692 of 925 (74%) Nodelists imported. Analyzing the NDL2DB import runtime, the results shows, that the hash algorythm doesn't help so much as expected x1). Its faster to search indexed Node entrys and Nodelist lines in the database than doing a sequential array search. So i've decided doing a code rewrite by eliminating the hash procedures. Actual there are 585 of 924 (63%) nodelists imported. x1) Typical performance report "average access times"
The NDL2DB import tooks a long time on executing the import of the max sized nodelist years. After counting the nodelist lines and doing some improvements (i.e. added a workqueue handling and ordering for multitasking) on the code the import speeds up. Actual there are 360 of 925 (38%) nodelists imported. Applied the automatic import of the newest nodelist updates with the NDL2DB import script. The result of the NDL2DB import script is a database with infos from Nodelists that can be queried. As of complete NODELIST.326 and NODEDIFF.333 a recompile of the NODELIST.333 was successful. NL91-333.ZIP replaced in archive. After testings import of Nodelists 1987-2008 from the Fido-History-Projekt Archiv has been started. All Nodelist archives in the range 1992-2000 in the Fido-History-Project archive was filestamped with wrong dates. Fixed the filedates of the raw Nodelist files with the timestamps of the related Nodediff files and repacked the archives with the ZIP -oj switch. All Nodelist archives from year 1991 in the Fido-History-Project archive was filestamped with date 31.12.1991. Fixed the filedates of the raw Nodelist files with the timestamps of the related Nodediff files that seems to be ok (they varys around the distribution dates with different times as nodelist was created and distributed) and repacked archives with the ZIP -oj switch. Some archives in the Fido-History-Project archive are filestamped with dates from 2007 or other wrong filedates. Fixed the filedates of some Nodelists and most Archives with the ZIP -oj switch. for integration into the Fido-History-Project Archive. Standalone version of the Fido-History-Project's Website as integrated under http://ambrosia60.dd-dns.de Modified for portability with relative paths and moved, integrated pictures. R28 Pointlists archive files found under R23 2003 Boss - moved back to correct location R28. Recovered original state. Dont know when happened. But still there are plans to recovery the mirror. Recovered some R46PNT Poss format lists year 2003, could not continue as of missing #248 diff. Recovered R46PNT Poss format lists year 2005 #112.
giving up. Too much mismatches between reverse engineered #365/93 and #358/93, from #049/94 with subsequent Diffs back to #365/93 that doesn't reflect possible changes from #358/93 to #365/93. Read also article about Reverse Engineering of FTN lists. Boss- and Points (V7) Format pointlists were unpacked. Now packed with zip. The live Fidonet NodeLists / Pointlists / Fidonews Archive (Script) @ AMBROSIA60 now includes Nodelists (and Diffs), Pointlists (and Diffs) (from Z2, R23, R24, R28, R29, R31, R34, R46, R50) and the Fidonews listing. ... from source 2:292/624, years 1997 - 2001, Boss- and Points (V7) Formats to the archive. Insert of R29 Boss format and Points (V7) format pointlists into the Fido-History-Project structure. Reset filedates of R29 pointlists according the publishing date. The test on a development machine for MySQL5 migration, NLARCHIVE2 import and update now successfuly finished. The auto update process for all new Nodelists, Nodediffs, Pointlists, Pointdiffs, Fidonews into the Live archive is now implemented. Recovery of R23 Boss pointlists for years 1992,1995-2005(#210) finished. Alex Woick presents version 2 of the nlarchive Perl script of the Nodelist to MySql5 db importer. Includes Nodelist History and Stats infos. Recovery of R24 Boss pointlists for years 1989-2001(#166) finished. I've also added a Fido-History-Project recovery mode to add addtl. infos into the header of the generated lists with source infos. Addtl. touch like filedate stamp routine to reflect the produced output filedate to the source file. from from source 2:348/609 and 2:341/14 years 2001, 2006, 2007 Boss and Fakenet Formats to the archive. Found 8 addtl. Z2PNT_D files from year 2002 on local harddisc. The live Fidonet NodeLists / Pointlists / Fidonews Archive (Script) @ AMBROSIA60 now includes Nodelists (and Diffs), Pointlists (and Diffs) (from Z2, R23, R24, R28, R31) and the Fidonews listing. A content search and statistics is still under construction. from 1992 - 2005, Boss and Fakenet Formats to the archive. To get the NLARCHIVE Perl Nodelist importer script working, i've first to start a MySQL5 migration. Before Migration on the production server i've started a test on a development machine. Most problems relates to the changed Password encryption policy from MySQL4 to MySQL5. The last Datteln Euro Con IV has passed without a note in the snooze but the meeting in the beginning year 2007 results with some fido- historical material that has been published since that on the web. Steven Leeman started publishing pictures from this international session on the web. A documentary film has been made late in the evening on January, 8th. 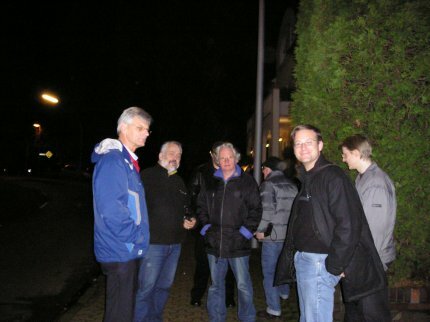 Participients were: from Belgium - Ward Dossche, Steven Leeman from Netherlands - Michiel van der Vlist, Kees van Eeten, from Germany - Alex Woick, Robert Bashe, Uli Schroeter and from Russia - Vladimir Donskoy. Via video conferencing from Sweden - Bjoern Felten. Where to find old Nodelists? All DIFF Files for a list now stored in a Sub dir named DIFF. All DIFF files will be saved as single file. Fixed PDIF1995 Pr24Diffs. Archiv contains 1994 diffs. removed 2 1994 diffs, added one found 1995 diff. Alex Woick presents version 1 of the nlarchive Perl script of the Nodelist to MySql5 db importer. 3.3.07 FIDO-HISTORY PROJECT #3 (continued) Together with Steven Leeman (2:280/264) i've reviewed and added the actual lists not yet found in the FIDO-HISTORY PROJECT #2 (ftp://ftp.grudolph.de/pub/fidohist Offline) archive. Actual work finished for the nodelists. Missing lists recompiled from earlier full lists and diffs. Added lists since 2004 upto actual day where the FIDO-HISTORY PROJECT #2 ends. Added scripts to automaticly insert newer lists into my FIDO-HISTORY PROJECT #3 archive. Yesterday i've copied and modified the nodelist script from Steven Leeman's project of reorganized Stevens Nodelist Archive. This archive is a repacked, files are renamed. The script works for nodelists and nodediffs. The same script, but for nodelists only is available under the link Ulis Nodelist Archive. R24 Pointlists and Diffs, Boss and Fake 2005-2007 review finished. R28 Pointlists Boss 2004-2007 review finished. R31 Pointlists Boss and V7, 1998-2007 reviewed. R31 Pointlists Boss and V7 completed. R24 Pointlists and Diffs, Boss and Fake 1989-2001 review finished. by recompile from diffs. Recovered in whole. and Diffs by restore from tape. R24 Pointlists and Diffs, Boss and Fake 2002-2004 review finished. 26.2.07 FIDO-HISTORY PROJECT One short question at the DattelnEuroCon 2007 ends in a revival of the Fido-History Project, first started at ftp://ftp.fidonet.org/fidonet/fido-history (this site is Offline). 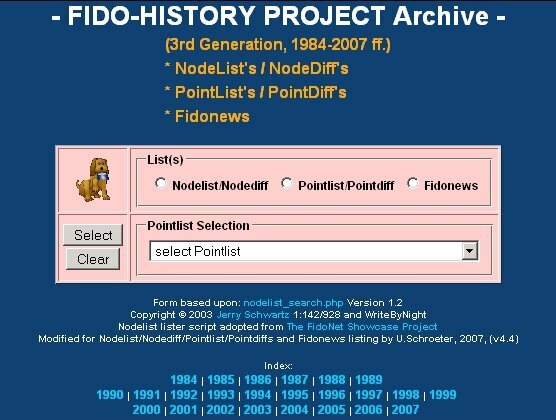 After research for resigned fidonet members i've contacted Gisbert Rudolph about his FIDO-HISTORY PROJECT #2 (ftp://ftp.grudolph.de/pub/fidohist Offline) (i'll name it the #2) archive that ends updating in 2004.
completed Points24 R24 fakenet pointlists 2004, #163 ff. Nodelist and Diffs review finished. completed Nodelist history 2004, #345 ff. completed Nodelist diffs 2004, #345 ff. Steven Leeman's question: Where to find old Nodelists? is still open.